Normal wear includes but is not limited to:loose strands or strings, small snags / pulls, light pilling, dust, fuzz, hair, slight odors, wrinkles, slight fading of the material, light soiling and small stains, pin-sized holes, etc. Washington Wizards 7 1/2 fitted hat. It is 40"W and 42" tall from bottom to top and is made of heavy duty cardboard. It could easily be hung on a wall, ceiling, ect. and it is double sided! 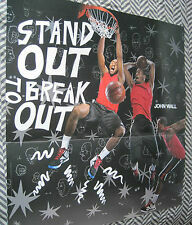 It would be a great addition for any Reebok fan, John Wall fan, Washington Wizards fan or sneaker head. Fantastic gift idea for Wizards fans. This incredible mock turtle neck is available here in Adult Size 2XL. Fantastic gift idea for Wizards fans. SIZE 3XL 8". SNAP UP WARM UP PANTS. Antawn Jamison Washington Wizards #4 Reebok jersey size youth XL 18-20. Length 27". Armpit to Armpit 20". Washington Wizards Juan Dixon #3 Reebok Basketall Jersey #3. 26" Across from armpit to armpit. ITEM : NWOT Washington Wizards Reebok Sleeveless Warm Up Shirt. SIZE : XXL Tall. COLOR : Blue/Black. This is the Washington Wizards NBA Basketball Team, and has great color. White and a Black / White / Blue (under the rim/ bill. This is a sturdy baseball Cap. New and unused and Near mint condition, high quality product. ). Solid black tonal NBA Washington Wizards flat bill size 7 1/4 fitted hat with hologram. Raised Wizards logo embroidered across front, Reebok logo on side and NBA logo on back. 100% wool by Reebok. Jerry Stackhouse #42 Reebok Washington Wizards jersey size youth large (14-16). Length 26". Armpit to Armpit 19". GOLD STITCHED WASHINGTON WIZARDS LOGO ON CHEST. WHITE REEBOK LOGO ON LEFT SLEEVE. SHIRT IS BLACK. MADE OF 100% POLYESTER. JERRY STACKHOUSE. THROWBACK JERSEY. Hard to find throwback jersey. WASHINGTON WIZARDS. Size: ADULT X-LARGE (XL). I will work with you to resolve any issues or problems. ONLY if the item has been listed or represented improperly. 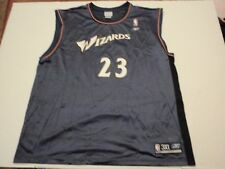 Vintage Reebok Michael Jordan MJ #23 Washington Wizards Jersey Size XXL. Condition is Used. Shipped with USPS First Class Package. Youth XL Length 2. Pre owned in good condition with no issues. For your consideration is a gently owned vintage Reebok Washington Wizards Jerry Stackhouse size youth large. It’s in pretty nice used condition with some stitch loss on the bottom which I’ve shown in the pics. Overall clean and pretty nice. Size: Youth Large (14-16) 100% polyester Measures 19” pit to pit Measures 16.5” from outside shoulder to shoulder Measures 26” from shoulder strap to jersey bottom Fast shipping in a poly mailer bag with tracking. Feel free to email with questions and let the pics be your guide. (For sale is an adult XL Jerry Stackhouse Washington Wizards jersey from Reebok Style: jersey. wholelotofnuthin/ ). /Clearly-Confused-Threads /). Juan Dixon jersey. Mild peeling of Wizards logo at edges. Size 4: armpit to armpit 13", length from base of collar 15". GOLD STITCHED WASHINGTON WIZARDS LOGO ON CHEST. SHIRT IS BLACK. MADE OF 100% COTTON. BLUE STITCHED WASHINGTON WIZARDS LOGO ON CHEST. SHIRT IS BLACK. MADE OF 100% COTTON.